CoyoteYou're Bowhunting in Kansas, So Would You Shoot This Coyote? 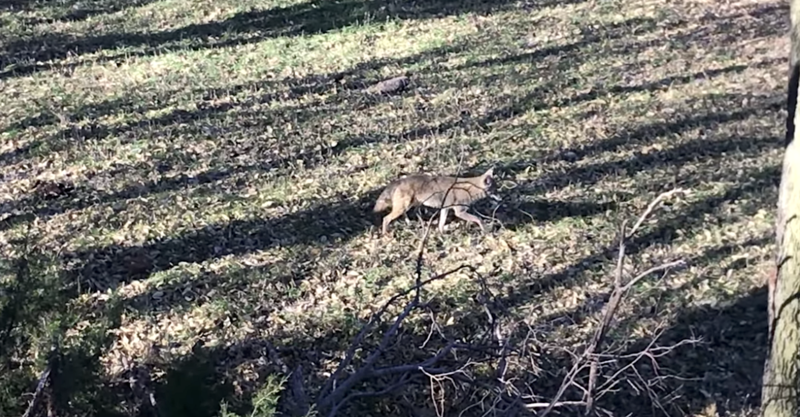 You're Bowhunting in Kansas, So Would You Shoot This Coyote? What would you do in this situation? You're bowhunting deer in Kansas, one of the best big buck states in the nation, and have a chip shot at a coyote. Do you let the coyote walk to avoid disturbing the area or take a shot? It's hard to argue with what Kansas has to offer, from the fantastic upland bird hunting to great opportunities for whitetails, turkeys and predators. Given the diversity in geography from east to west — hardwood forests on one side transitioning to open vistas on the other — hunters can find themselves with a bounty of choices to make in autumn. Coyotes (Canis latrans) are not legally classified as furbearers in Kansas, but in many ways, they are monitored and managed as if they were. Coyotes are actually considered nongame, as a result of historic attitudes and the potential for conflict with the livestock industry. They are not afforded the protection of a harvest season like our furbearers, but their cunning and adaptability are legendary, and it is difficult to conceive a more resilient animal. After surviving decades of cyanide guns, strychnine-laced carcasses, widespread trapping and shooting, bounties, and the all-out ire of mankind, the coyote has responded by expanding its range eastward into parts of the United States where it had not previously existed. In recent times, coyotes have become increasingly adapted to urban life, and have been implicated for attacking pets and even people in a few states where trapping bans have outlawed the most effective harvest technique. It's pretty much open season on coyotes and it apparently doesn't bother them a bit. In late October 2017 I hunted in northwest Kansas with Heartland Pride Outfitters and Lacrosse footwear. Five of us piled into the snug, warm house Heartland has in Phillipsburg for the week and had a heck of a time bowhunting deer in a fantastic part of the country. We saw bucks that gave us the liver-quiver shakes but never presented a shot. I watched a mule deer doe and two yearlings one afternoon. One of our crew shot her first whitetail and another had an encounter with a gnarly buck that she killed this season. A couple of days it was bone-chilling cold and a couple of afternoons we were wondering who turned on the heater. Typical Kansas in autumn! We saw and heard a variety of wildlife, birds, laughed our tails off and had a great week. I believe everyone saw and heard coyotes, too. We were hunting little hardwood thickets or fingers amid agriculture fields that had been picked or were close. The entire area is perfect for coyotes thanks to plenty of food, habitat and minimal hunting pressure. One afternoon in a great little spot, I spied movement to my left. Before I could grab my PSE bow off the hook this coyote slipped into view. I decided to shoot a quick video instead of taking a shot. I certainly gave it a hard thought, though, and weighed the options: attempt a shot at a coyote and have a cool story, or let the coyote walk and wait to see if a big buck showed up? I passed on the shot. But a lot of hunters turn a deer or turkey hunt into a coyote hunt when a songdog comes within shooting range. With a bow or gun, what would you do in this situation with a coyote under your stand?